The Striped Marlin (Tetrapturus Audax) also referred to as the “New Zealand Marlin” in some Pacific regions is named for the glowing vertical bands of bright blue that light up when its feeding or attacking bait. Like all marlin they’re extremely acrobatic when hooked so keep the camera handy as their aerial displays are impressive and common and will certainly be a memorable moment for anyone. The body of the Striped Marlin is stretched out and compressed. It also have the thinnest bill of any marlin species but the highest dorsal fin, which normally is at least equal to the depth of their body. Distinct from a Black marlin the leaf shaped pectoral fins on a striped marlin can be folded alongside the body. The striped marlin’s lower jaw is narrow and pointed, whereas blues and blacks have solid, stocky lower jaws. Blue marlin do display stripes too, which may cause confusion with striped marlin at times, but the stripes on a blue fade very quickly when stressed or dead. The bars on a striped marlin remain prominent even after death occurs. Like most Marlin, Striped Marlin travel the tropical and sub-tropical waters of the Indian and Pacific Oceans, ranging down as far south as latitude 34 degrees. They are commonly found in water temperatures that ranging from 65 F to 75 F (18 – 23 Celsius) and are the most widely distributed of all billfish. We do know that striped marlin spend most of their time in thermocline which is the upper layer of the ocean just beneath the mixed layer. 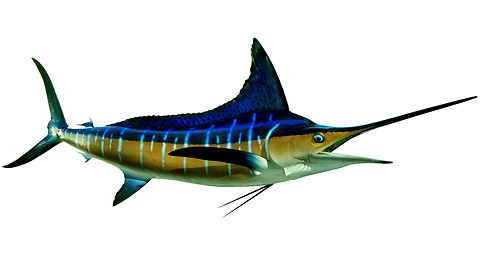 Striped marlin are a highly migratory species. The striped Marlin can reach 14 feet (4.2 m) in length and 450 pounds (over 200 Kg) but most angler caught Striped Marlin are under 250 pounds (around 100 Kg). The world record is 494 pounds (225 Kg) caught in NZ and the California record for striped Marlin is 339 pounds (153 Kg). Even though wooden boats have been pierced by the Marlins, the bill of the Striped Marlin is used for defense but more importantly as an aid in capturing food. It swims through schooling baitfish thrashing its bill from side to side stunning and injuring the bait for an easy meal. Fish that are included in the Striped Marlin’s diet are anchovies, pilchards flying fish, mackerel and squid.